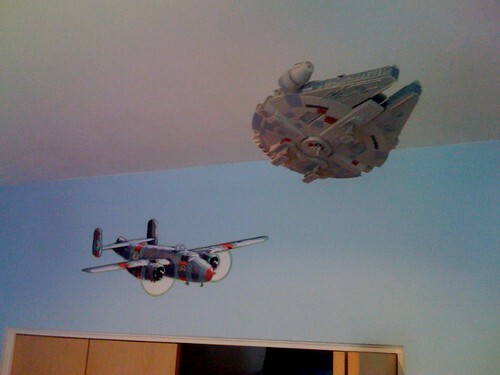 We decorated the kids' rooms in the new house. 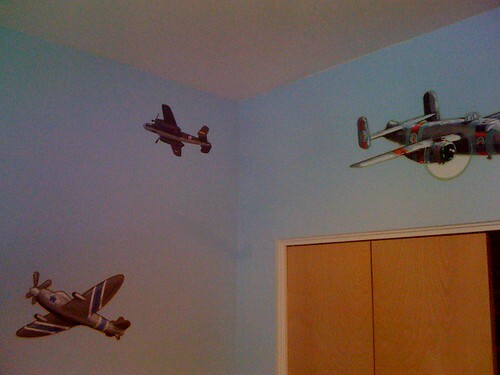 The boys are sharing a room and we put up some stickers of WWII-era planes. As part of that, Tom and I went to the hobby shop to pick out some models to put together and hang from the ceiling. I told Tom to pick some out that were similar to those in the stickers we put up. He did a pretty good job as you can see from the bomber below. He also is a pretty good history buff for a four year old. He was aware of the little-known secret weapon that garnered the Allies a real advantage over the Germans: The Millennium Falcon! What was I going to do? Turn down a chance to work on the Millennium Falcon with my kid? C'mon!